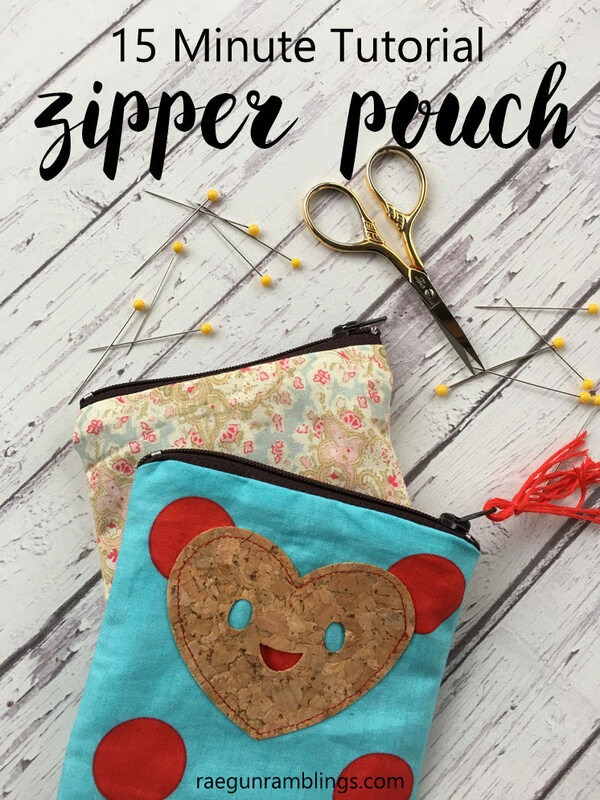 With just 15 minutes and a few scraps of fabric you can have a darling zipper pouch. 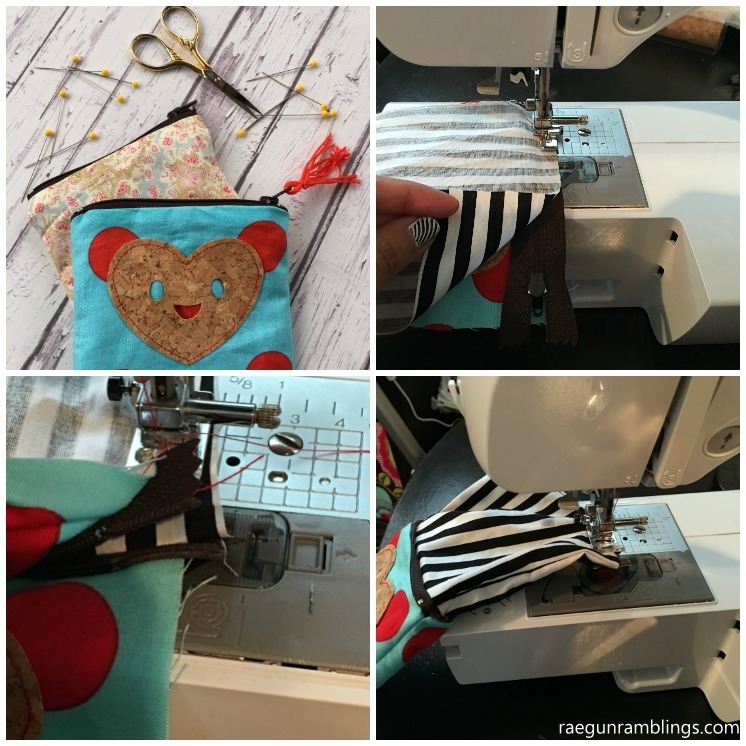 This quick tutorial is great for making quick gifts, trinket holders, or you can easily change the dimensions up to make bags of all sizes. It’s so easy to change the look with different fabrics and embellishments. 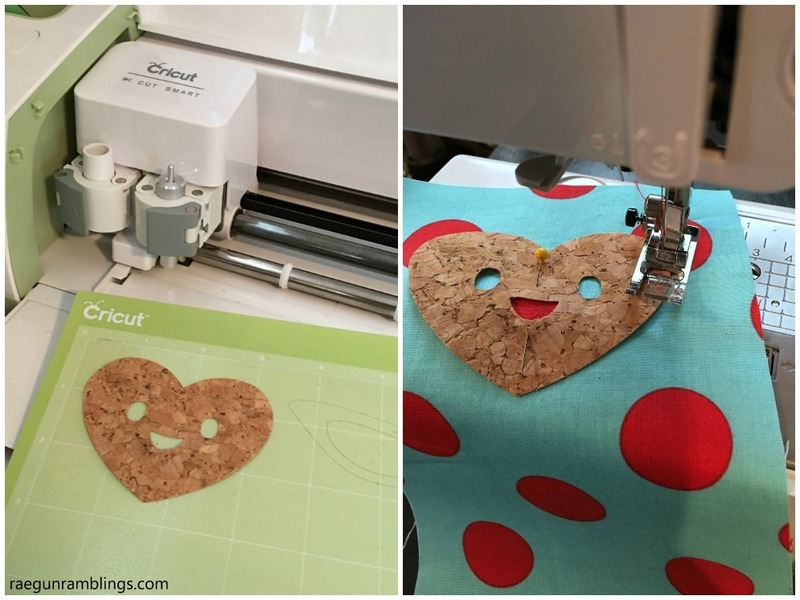 For this one I used my Cricut Explore to cut out this really fun Cork Fabric to make a the Happy Heart. I’m excited to play even more with this DMC cork fabric since it cuts fantastically and you can sew it like a breeze. DMC also makes a Cork Fabric that looks really fun and you can stitch on also. If using the cork fabric or other embellishments cut it out. I cut my happy heart design that I got from the Cricut Design Space using my Cricut Explore. I cut it on the “card stock” setting with the cork side up and a regular blade and it worked like a charm. Position your embellishment on the outside fabric. Remember that the outer piece will be folded in half. Sew it on. 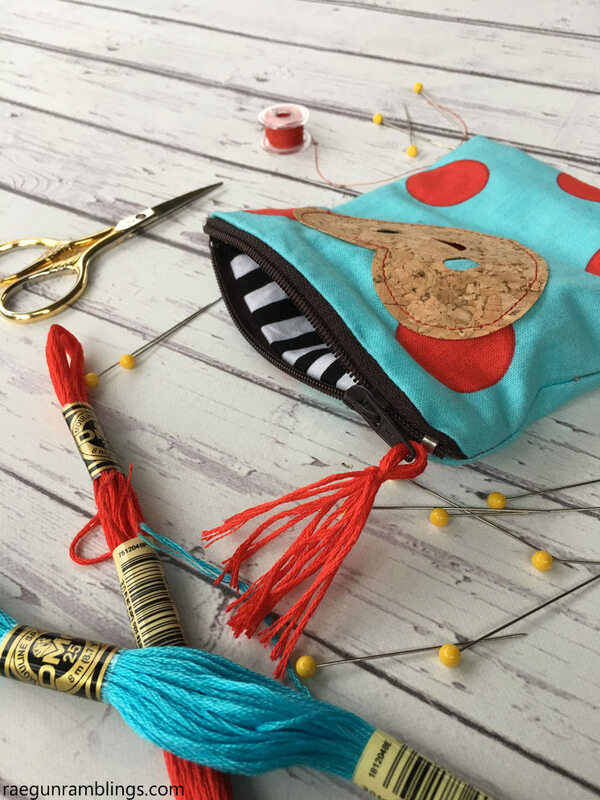 Start by sewing fabric to the zipper. Lay the zipper right side down to the outer fabric with the zipper facing towards the outer fabric and lay the right side of one piece of the inner fabric to the back side of the zipper. 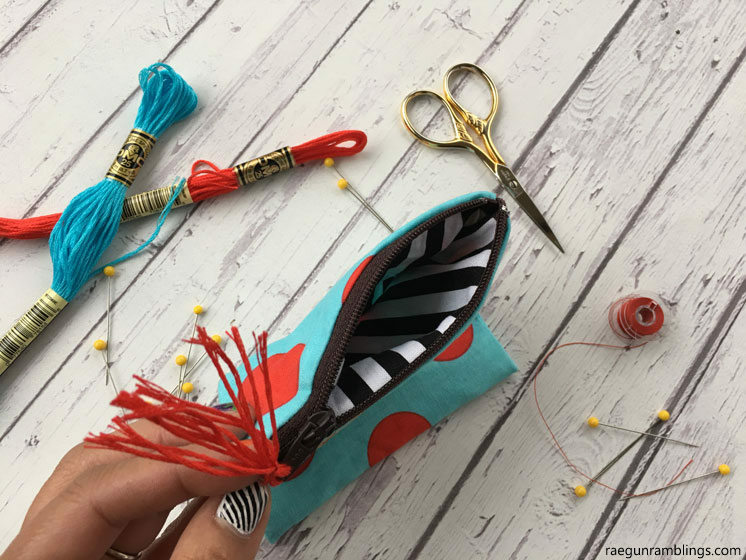 The zipper should be sandwiched between the outer and lining fabric with the right side of the zipper facing the right sized of the outer fabric. Using a zipper foot sew the three layers together. Repeat on the other side of the zipper. The outer fabric will be folded and one piece of inner fabric should be sewn to each side of the zipper. Fold the fabric so the inner fabrics are right sides together to themselves and the outer fabric is folded. Unzip the zipper most of the way. Sew around the bottom edge of the lining fabric and down each side of the lining fabric through the side of the zipper and down each side of the outer fabric edge making sure to leave an opening on the bottom edge of the lining fabric. Flip the pouch right side out. 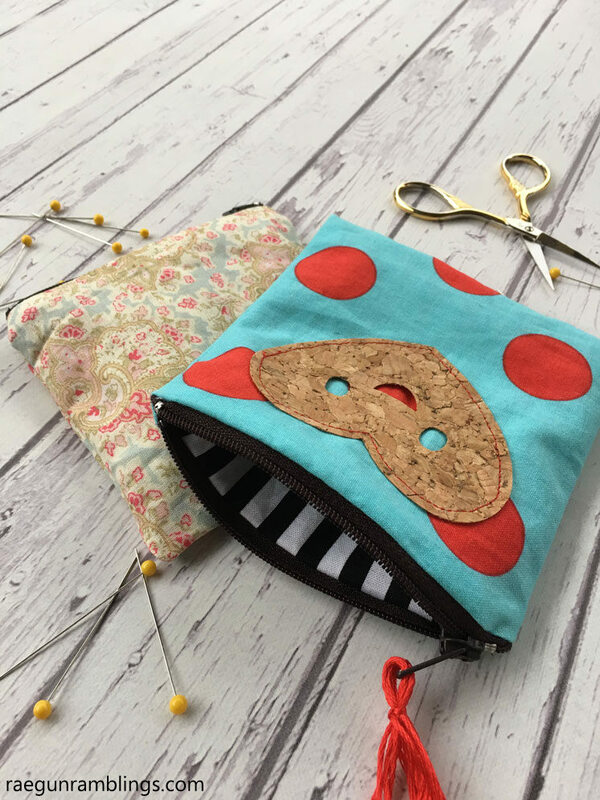 Sew up the opening in the lining and tuck it into the pouch. String a few threads of embroidery floss through the hole in the zipper pull and tie with a small piece of thread. I just love how this turned out. I might have to make more though because my niece saw it and totally claimed it. Luckily it really does only take 15 minutes. Marissa, this is so SO cute!!! All of your crafts are just the most adorable ever! I would really like to talk with you, but your email did not work. Is there any way that we could talk? I would really appreciate it!